Zonta Gawler Inc is a proud supporter of The Birthing Kit Foundation (Australia). We arrange a number of assembly days each year and invite community members to join us in making up the kits. The Birthing Kit Foundation (Australia) is a voluntary, not for profit NGO that provides birthing kits and education in clean birthing practices to women who give birth at home in remote regions of the developing world. The aim of the Foundation is to reduce the incidence of infant and maternal mortality and morbidity, and it has no religious or political affiliations. The United Nations (W.H.O.) estimates that 585,000 women die annually in childbirth. Developing countries account for 99% of these deaths. For every woman who dies in childbirth, another 30 women incur injuries and infections - many of which are often painful, disabling, embarrassing and lifelong. 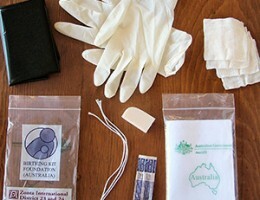 The Birthing Kit Foundation (Australia) has researched, developed and is now supplying BIRTHING KITS that provide for clean birthing conditions. 60 million women give birth each year with the assistance of a Traditional Birth Attendant or with no assistance at all. These women need a birthing kit. Clean ties - to prevent bleeding from the umbilical cord for mother and baby. What is a Birthing Kit?